Gion Kawakami does not have a set menu that changes from month to month. Rather, we use seasonal ingredients to change our menu from day to day, based on our individual guest's requests. As our establishment cherishes the irreplaceable bond it has with its guests, we are devoted to providing good service and cuisine that each and every guest can call "delicious" with a smile. We strive to prepare cuisine that makes full use of the natural flavor and fragrance in its ingredients, so that guests can enjoy the finest luxury nature has to offer. In January, as we greet the new year, we place kadomatsu (bamboo and pine bound in straw) in our alcove, and decorate our dishes with hanetsuki rackets and pine branches. Our menu for January makes use of such auspicious ingredients as sea bream, baked clams, and black beans. In February, as we await the coming spring, Gion Kawakami provides a menu themed around Setsubun (the holiday for the end of winter). edible wild plants, and fava beans. prepare the most splendid menu of the entire year. at Gion Kawakami, reaches its peak flavor in this season. In May comes the the Boys' Festival. As a change of pace from the splendid show in April, we carefully choose more dignified ingredients and dishes to serve them in, decorated with irises, arrow feathers, armor, helmets, and bows. In June, anticipating the arrival of summer, Gion Kawakami serves grilled freshwater trout caught in Lake Biwa and the Ado River. In July comes the Gion Festival. During this season, we serve three different dishes using pike conger, including boiled pike conger with pickled plum paste, grilled pike conger, and pike conger stew. For 30 years, Gion Kawakami has served tomato compote, a dessert devised by our predecessors, which is now one of our establishment's most famous summer treats. On the 16th of August, during the Bon holiday, Kyoto celebrates with Gozan Okuribi (bonfires on five mountains). As we greet the spirits of our departed ancestors, we prepare our menu and select dishes to serve it in while remaining aware of spiritual devotion. In this season, Gion Kawakami serves rice boiled with barley and sea bass in place of regular white rice. In September, although it is not yet fully the season for these ingredients, we prepare an autumn menu incorporating the first freshly picked Shinshu matsutake mushrooms, new gingko, and Tamba chestnuts. In October, the one ingredient crucial to evoking the flavor of fall is matsutake. Gion Kawakami uses mushrooms chosen by a renowned matsutake picker living in Fukushima, Kiso, Nagano Prefecture. November is the season for picking scarlet maple leaves. Locations around our establishment famous for their fall colors, such as Kenninji Temple and Maruyama Park, are thronged with tourists. Gion Kawakami serves chestnuts, gingko, matsutake, and persimmons, as well as steamed fish with grated turnip on top, starting in mid-November. December is the month when the real winter cold first visits Kyoto. Snow crab, the king of winter cuisine, finally comes in to season. 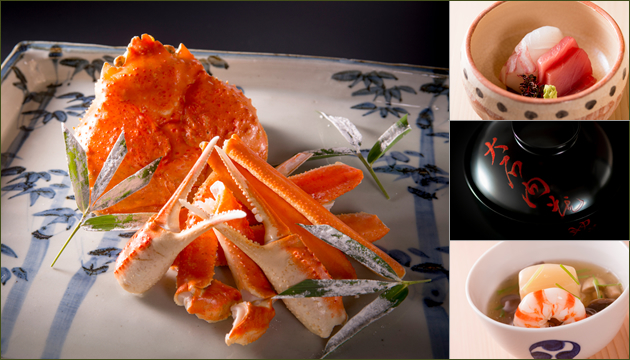 At Gion Kawakami, we serve crab brought from Kasumi, Hyogo Prefecture. accounts of the 47 Ronin called "Chushingura". We retell the story of Chushingura using bowls with the names of the 47 ronin written on them and dishes bearing their distinctive comma-shaped crest. We also arrange dishes in the image of Matsu no Oroka (a part of Edo Castle) and Ako Castle (where the ronin raided Kira Yoshinaka). For these three days only, we provide each guest with a written menu, and encourage them to enjoy the unique pleasure of reading about how each dish follows the story of the 47 Ronin to its conclusion.